Puerto del Carmen in Tias is an image of fun and seaside perfection. Fringed by azure crystalline water, it has four beaches of golden sand. Restaurants and shops line its promenade on one side and stunning vistas on the other. Holidaymakers of different ages, interests, and means consider it a haven. 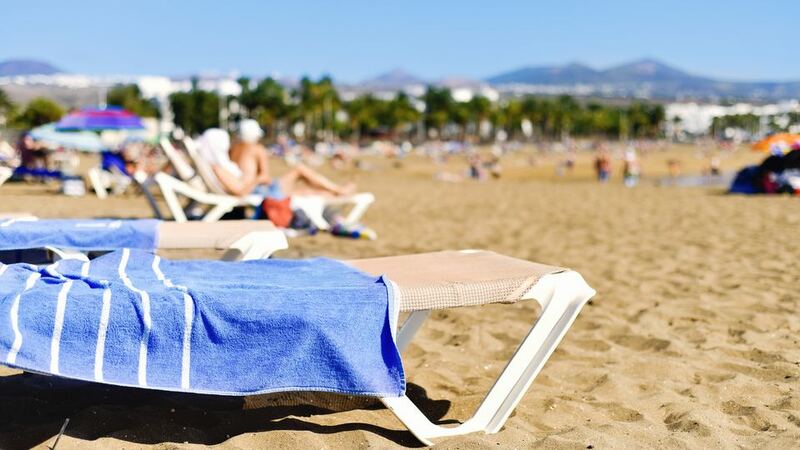 It is Lanzarote‘s oldest and best-known resort, and there are plenty more reasons why it’s still number one. The 1960s proved to be a defining decade for the Canary Islands. It was their period of rebirth and introduction to the world of tourism. 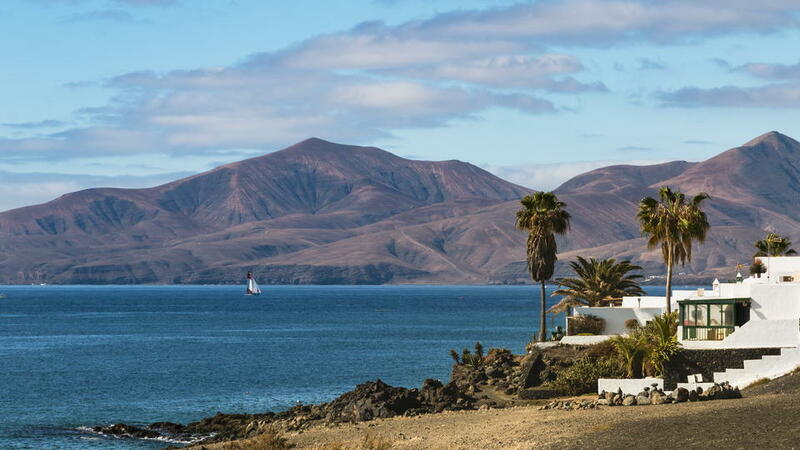 Like most of the archipelago’s coastal destinations, Puerto del Carmen also started as a humble fishing village. In 1966, though, Hotel Fariones opened, and the charming seaside became Lanzarote’s very first resort. With a new booming industry on its shores, growth and change were inevitable. To cater to the influx of vacationers, the beachfront “new town” was built. 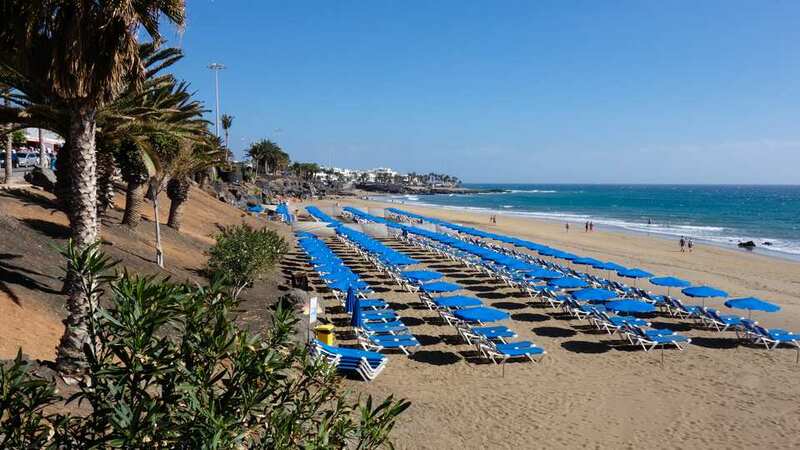 Relishing all 6 km of glorious beaches, it quickly became the place to be when in Puerto del Carmen. Not to be outdone, the old harbor still boasts superb restaurants and timeless charm. 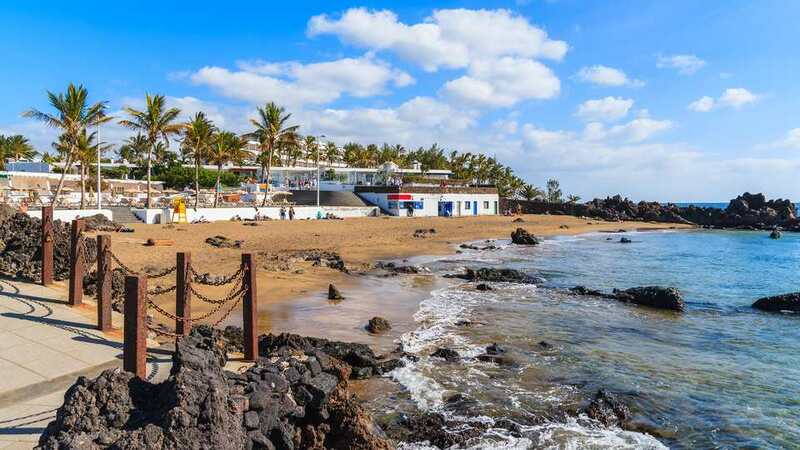 Most of Lanzarote’s millions of visitors go to Puerto del Carmen, which makes it its most famous and undisputed best attraction. With plenty of other options in and outside the island, that indeed says a lot. Enjoy not one but four beaches, taste different cuisines every meal, go for a new activity or two every day, walk from old to new, shop ’til you drop, or just lounge and bask in the sun. Try everything or maybe one thing. In this town, there’s a whole lot for the taking. 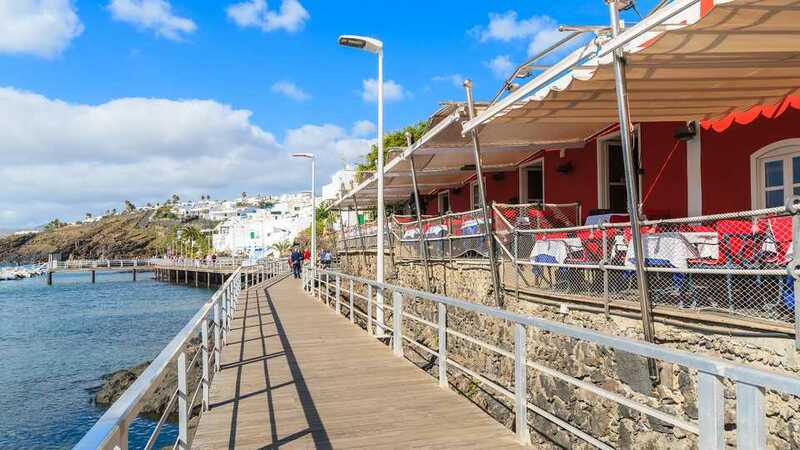 The famous sandy trio of Puerto del Carmen is the main reason why holidaymakers flock to the town. Although practically neighbors, they have different features and selling points. Of the four and among all the beaches in the island, Playa Grande is the most frequented and trendiest. And, the reasons why this six km-long urban waterfront spectacle is a favorite are as clear as the Canary sky. Aside from its calm bay and obvious beauty, it also outfitted with great amenities. Scarcity of sunbeds, parasols, showers, and parking space never happen. Lack of retail and gastronomic choices is just as impossible thanks to Las Playas avenue. Often referred to as ‘The Strip’, this promenade has a chain of shops, restaurants, and bars that overlook the magnificent blue sea. Considered the family-friendliest sandy stretch in town, Playa Grande has tranquil waters and is also a certified blue flag. It means the beach meets 27 strict criteria concerning water quality, environmental management and education, and safety and services. Clean and safe yet fun, parents need not worry for their kids. Activities such as paddling and swimming are most suitable here too. For tourists looking for subaquatic activities, Playa Chica is the place to be. Acting as jetties are the volcanic rock formations that enclose the tiny bay. These natural barriers ensure that waters are always placid and clear. Merged with sandy seafloor, the cove is ideal for snorkeling and diving. Many dive tours start here as there are several exciting underwater attractions nearby. Among them is Lanzarote’s top dive spot, Veril de Playa Chica, an underwater cliff with a 15 to 40-meter drop. Here, caves, volcanic channels, colorful corals, and spectacular marine life are found. Besides conventional deep sea diving, night diving is also amassing quite a following. Thrill-seekers who prefer to stay afloat, however, can try jet-skiing, banana boating, parascending. Only a few kilometers from Playa Grande are the embodiment of peace and quiet — Playas Matagorda and de Los Pocillos. Watch ferries pass by and planes land, listen to the music of gentle waves, and not mind the few other souls also reveling in the silence. Luxuriate on what are missing — noise, hordes of tourists, ball sports. Yes, even the last one isn’t allowed. Those with children, though, can make use of the playground and crazy golf by the beach. As both beaches have flat waters and strong breeze, they are paradise for windsurfing too. To keep vacationers coming, even the most breathtaking coastal paradises should have more to offer other than the sand and the sea. Else, no matter how beautiful, they will never be more than a day-trip destination. This is precisely why Puerto del Carmen didn’t put all its eggs in the beach basket. Just as fascinating as its shores are the places and establishments that surround it. Off-water sports or leisure activities such as cycling and running are especially prevalent along the promenade. As such, this is also where various bike rental shops are. Only a few minutes outside the town is Lanzarote Golf Resort. Although not located in Puerto del Carmen, it the reason why more and more golfers are staying in the area. It also a good option for those who want to try the club and ball sport. Shopaholics and bargain hunters are in for a treat. With a prolific number of retail shops, they can purchase and stretch their budget as much as they can. The sky is the limit! Or, in this case, how much one can spend is. For good buys, head on to the Strip. Whereas, for extravagant price tags, the Biosfera shopping complex is the place. Party with the locals from the end of February to early March for the Carnaval. By May or June, break a sweat in the Lanzarote IronMan triathlon, a major international athletics event. Last but most certainly not the least, join the Fiesta de Nuestra Señora del Carmen by the end of July. Residents go all out for their patron saint with folklore performances, dancing, and singing until early the next day. One of the top attractions in Puerto del Carmen, the animal and water park appeal to vacationers of all ages. It’s also whole day activity for the entire family, so don’t make other plans for the rest of the day. In the morning, get to know different wildlife like rare white tigers, charming sea lions, and shy armadillos. By noon, have fun in the pools and plummet down the slides. Come afternoon, watch the eagle show and see a wide variety of birds. Puerto del Carmen is vibrant day in and day out. At night, though, it sparkles even brighter. Both the old harbor and Las Playas Avenue boast a great selection of bars, pubs, live shows, and nightclubs. The center of the Strip, though, mainly appeals to the young adults. Whatever means or budget tourists have, there are undoubtedly several accommodations that will meet their needs. It can be beachfront, near the old harbor, or as secluded as possible. If they want it and can afford it, they can have it. Lani’s Suites de Luxe, an adult-only hotel, is the best value for money. All suites are air-conditioned with free WiFi, have a terrace or a balcony with sea and pool views, and a seating and dining area. For comfort and leisure, there’s also a swimming pool and a restaurant within the property. 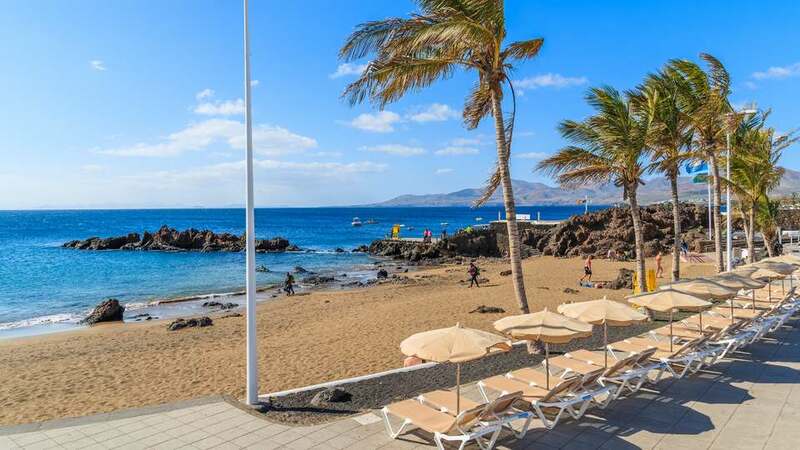 Only a quick five-minute walk from Playa de los Pocillos, the budget-friendly Hotel Floresta is in a fantastic location. Each apartment can host up to two adults and two children, is air-conditioned, and has a seating area. Guests can also enjoy the complex’s marvelous facilities such as the swimming pool, tennis courts, restaurant, bar, gardens, and playground. Every corner, section, and area in La Isla Y El Mar Hotel Boutique screams posh. Perhaps the most elegant accommodation in Puerto del Carmen, they are also known for their excellent customer service and amenities to match. Guests can take a 6-minute walk to the beach, or have fun in the outdoor pools and the poolside bar. Facilities like the gym, Wellness and Beauty Center, buffet and à la carte restaurants, and the chill out area that overlooks the Atlantic also make sure vacationers need not leave the premise to have the ultimate holiday experience. Staying in their suites isn’t a bad idea too, as all units come with a private terrace, seating area, and minibar. As Lanzarote’s best-known resort, naturally, the island’s top restaurants are here too. Limited is a word that will never be used to describe the food scene in this town. Diners can try different cuisines every meal. Budget also doesn’t dictate the quality of dishes. There’s a delicious plate waiting for every type of taste bud, and a view to accompany it. Deemed as the finest in town, Lani’s Cafe Restaurant serves Mediterranean and Spanish art on a plate. Their best-selling masterpieces include Amuse-bouche, Chateaubriand steak, and beef stroganoff. For desserts, do try their creme brulee and white chocolate soup. Most importantly, go al fresco and savor their menu together with to die for vistas. My Kitchen By Julius‘s claim to culinary fame is their steak, best in town people say. Other must-trys in this tiny grill house are their caesar salad, goat cheese, chicken fajitas, chorizo, roast lamb, and king prawns. For the sweet tooth, don’t pass on their cheesecake and pudding. Cheap and all-you-can-eat, the Peking Duck offers unlimited Asian delights. Their regular lineup includes Peking duck (of course), sushi, noodles, spring rolls, pancakes, and ribs. For a buffet that is worth twice or thrice what diners pay, look for the fat laughing Buddha and two green dragons by the entrance. 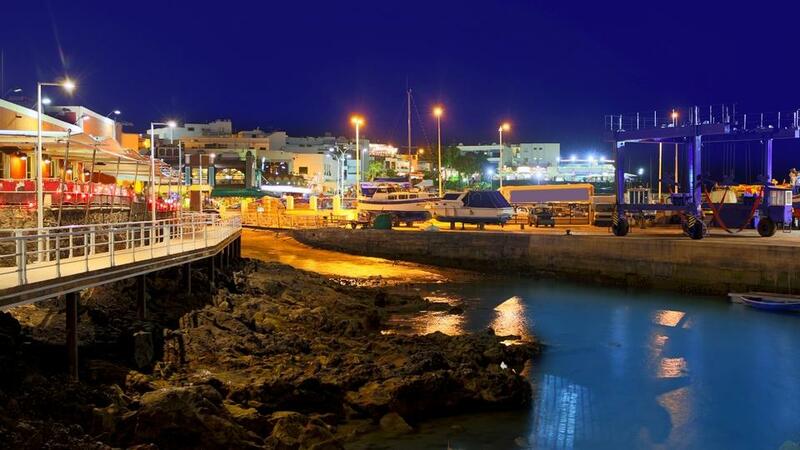 Majority of Lanzarote’s tourists visit the island for Puerto del Carmen. As such, four bus lines cater to the coastal paradise from different start points or towns. Bus number 02 hails from Arrecife, 03 from Costa Teguise, 12 from Teguise Market, and 161 from the airport which is only 10 minutes away. To go around the town, vacationers can go by foot, bikes, car hires, or mopeds. 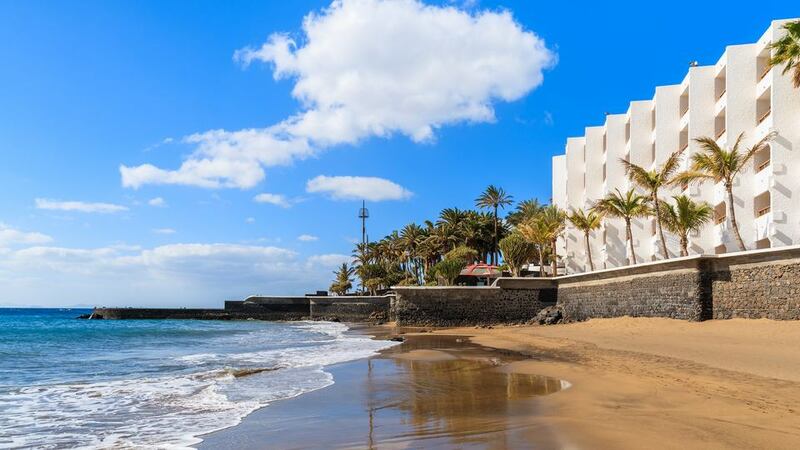 The undeniable stars of Puerto del Carmen are its four beaches. All enchanting yet distinct from one another, each has something enticing to offer. Then, there’s the charming old harbor and The Strip for some leisure and entertainment on dry land. Boasting a wealth options to its visitors, this coastal town is indeed an all-around resort.